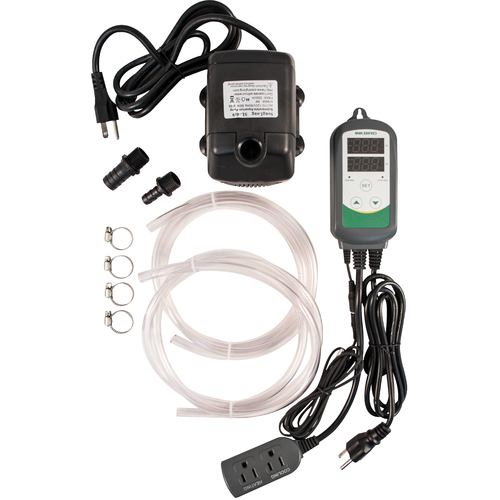 Manage your fermentation temperature like a stone-cold pro with our Glycol Pump Kit! This kit can use either ice water or glycol as a chilling solution, which is then circulated through your chilling coil or cooling jacket by the included submersible pump. With a 800 gallons per hour flow rate and a max lift height of 9 feet, this unassuming pump is powerful enough to circulate your cold solution with ease. And with the Inkbird Dual Stage Temperature Controller running the show, you can feel confident that your fermenters are getting the chilling power they need, when they need it. ​If you're searching for an affordable pump to use with your temperature control system, look no further. This submersible pump can be used with an icebank or glycol chiller. Don't be fooled by its low profile compact design. With a flow rate or 800 gallons per hour, and a max lift height of 9 feet, this unit is sure to keep the solution moving in your chilling system. Comes with 1/2 in. and 3/4 in. plastic barb. Max Lift Height: 9 ft.
Comes with 2 barbed nozzles - 1/2 in. & 3/4 in. The Inkbird dual stage temperature controller is an easy to use and economical controller that is perfect for home brewing. Inkbird controllers allow you to control both heating and cooling, and set independent differentials for each to protect your heating and cooling devices. The Inkbird ITC-308S controller performs many of the same functions as the Ranco or Johnson but at a more affordable price, making it a great alternative for temperature control. Aside from brewing uses, this is a great dual relay output temperature controller for cooking (use in a smoker or BBQ), home growing (heat mats for seedlings, climate control), or any other DIY project you come up with! Need a simple cooling solution for a 100 liter fermentation tank.